At the end of the 1800s Easton was a mixture of housing, coal mining, industry and market gardens. The population of Bristol was increasing rapidly and with the religious boom in the second half of the 19th century, an 1881 survey showed 45% of the population of Bristol were attending weekly services. 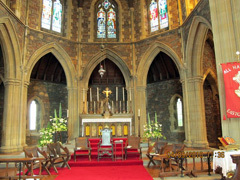 On 16 May 1893, All Hallows, a daughter church of All Saints in the City of Bristol was created as a district of St Mark and St Matthew Moorfields. On the 24th June that year the Vicar of All Saints in the City, Fr. Boustead was licensed to the newly founded district of All Hallows. On the 3rd of January 1894 the Bishop dedicated an Iron Church. The 9th of October 1899 marked the Dig of the First Sod of the new church by children from the Sunday School. The 17th of March 1900 saw the Laying of the Foundation Stone by the Master of the Merchant Venturers’ Society. 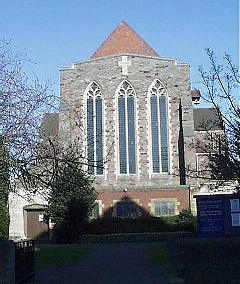 The new church, designed by Sir George Oatley, famous for building the Bristol University’s Great Tower at the top of Park Street, was consecrated by Bishop Forrest Browne, Bishop of Bristol on the 2nd of November 1901. On the 17th of May 1903 there was further consecration of the more complete building. 1921 saw All Hallows being made into a separate parish. 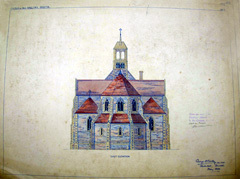 In 1939 the iron church was removed and the present building was completed. Although Sir George Oatley had intended a further two arches to the nave and a tower, this tall church has a main arcade, though inspiring in scale it is deliberately undramatic in detail in order to concentrate on the east end. What Oatley achieved in the east end is an unmistakable concentration of emotional energy, defining the choir as a sanctuary without surrendering it from contact with the wide and open spaces of the congregation; his church is both fully congregational and liturgical.